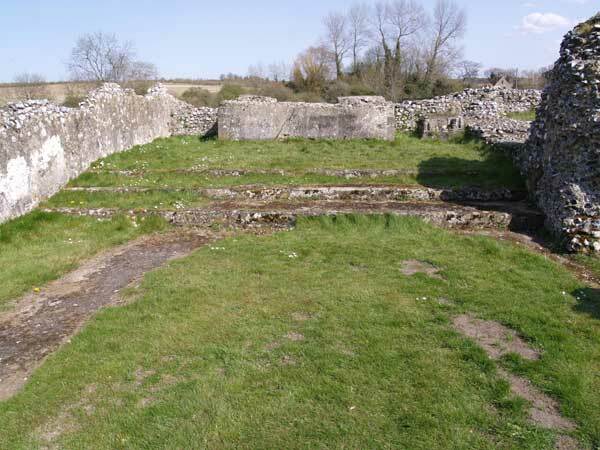 The Presbytery had three eastern apses, each of which would have contained an altar; the line of the apse is visible in the ground on the left of the picture, turning under the first step. As the cult of the Virgin Mary developed particularly in the 13th century, it was natural that a special chapel should be set aside to honour the 'Queen of Heaven' which was usually placed as near to the high altar as possible. In the parish church, it is probable that the Lady Chapel took up the two most easterly bays of the north aisle. It is similarly probable that this northern aisle was initially used as the monastic Lady Chapel. The Priory however was never allowed to continue in its original state. Building works and alterations continued to be undertaken throughout its history. A great deal was done by de Parco who was prior from 1227 - 1244, which included the great addition of the great western front to the church. The Eastern end of the priory was also re-modelled in the Perpendicular style (about 1350 onwards) and the apses were squared off and slightly extended as we see them today. There is also an interesting rectangular building to the immediate north of this apse, whose walls are no longer standing, though it is partially marked out on the ground. It has been suggested that this is a later Lady Chapel, probably 15th century, and many new chapels were built in this position.